Ask The Bellwether: What is a Bedouin Spindle? What is a Bedouin Spindle? Top (or mid, if you like) turkish spindle. Made by Ray's Spindles, bought from him on-line a few years ago. A fun little spindle. 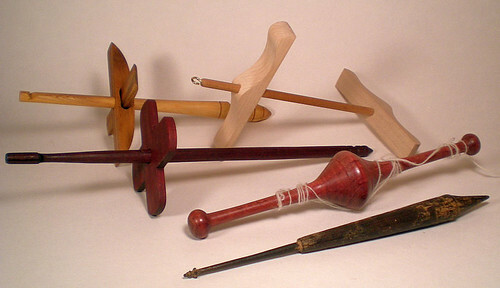 Niddy-noddy spindle. From The Woolery. Pretty cool, you wind-on like a niddy-noddy as you spin. Wa-la, skein when done! Not sure how much it holds, but it does actually work. Bedouin spindle. From Detta's Spindles, also made by Ray. All purpleheart, pretty cool. Balinese spindle. Bought at Estes Wool Market a few years back. Pretty, no? I've not spun on it, though I imagine it's a support spindle of some sort. I was asked how well the Bedouin spindle spins. It's a decent spindle, as spindles go. I love that it's all purpleheart :-) that's fun! I honestly don't think that I've ever filled it full with yarn, just tried it out and used it randomly on scraps here and there. It has a notch-and-groove arrangement, so you can half-hitch it near the top (if you find you need to) and then bring it up through the groove so the yarn comes down the middle of the shaft, for a reasonably well-balanced spin without a hook. Give the whorl can be removed, it would be handy to have two of them, then you could fill up two and wind a two-strand ball from the two full whorls -- the shape of the whorl would probably keep your spindle-full from rolling away, that is, if you would around the whorl as if it were a Turkish, rather than below the whorl like a top whorl. The whorl piece, however, being one piece, would remain stuck in the center of the ball ~ you would have to unwind the yarn from it. From a little bit of internet research, it appears that current Bedouin spindles are quite a bit larger ... see this picture in this post, and that they use their spindles as top whorls, filling below the whorl. There was also a man (a man! hooray!) spindling at a Bedouin market. His spindle appears to be a mid-whorl, and he's completely covered it with yarn! There isn't any mention of the Bedouin spindles in Bette Hochberg's "Handspindles", though she has the whorl shape drawn in her diagram, "Basic Spindle Whorl Shapes". I also don't recall mention of it in any other books, so if you've seen one, let me know! That about sums up my experiences with it -- happy spindling! Ha! I'm glad you like my crabby spinner, Amelia. I have the original of that card right here on my desk. How did you try using the spindle? As a drop spindle? Or with a distaff as a hand spindle? The latter will work; the former will not. The physics aren't right for it to work as a suspended spindle. Thanks for the suggestion, it will get me to try it again. hi Amelia, I couldn't find a book, but how about this closeup of a bedouin spindle: http://www.aramco-brats.com/museum/images/arabbedu023.jpg ? Long time lurker here. Let me break my silence to say two things. One, I really appreciate your blog. I've learned a lot from you. Thank you. The other is about the “Italian” spindle. I assumed it was the fresco by Francesco del Cossa that gave you the idea. It's here http://www.abcgallery.com/I/italy/cossa10.html or a slightly better copy here http://bp1.blogger.com/_IpZgksLQA_c/RlSa7Q-u1LI/AAAAAAAAAWA/uIvPSdhW6-s/s1600-h/1march_0.jpg The spindle is held by the girl standing on the left wearing a white dress. Sorry, I cannot find the enlarged copy that shows the spindle better. @caroline: cool spindle -- rectangular whorl, and look at that round ball she built up on the shaft! wow. Definitely jibes with the idea that the "real" ones are (a) big and (b) the cop is built up under the whorl. Thanks! @beth: thanks for chiming in! I'm glad to see the spindles were in use in Italy, too :-) so maybe that's where the Italy came from. But she looks happy spindling, and I definitely remember the grumpy lady, be she Portuguese or some other culture. Of course, it could just be she was having a bad denture day, nothing to do with spindling at all! Hello, Can I ask you a question :)? I am looking into raising White French Angora Bunnies and White Angora Goats for yarn. I have been looking into spinning wheels for making this mixed yarn. I am thinking I want the Ashford Joy Wheel (http://www.joyofhandspinning.com/storefront/index.html?target=dept_20.html&lang=en-us)because it is portable. Its ratios are 6, 8, 12 & 15:1. Do you think these ratios would work for the French Angora Mohair yarn mix? @jeanine ... thanks for asking! I've put an answer up here. The spindle used by the old woman (who is holding it, not spinning at the moment shown in the painting) - it's covered by the yarn, so why did you think it was shaped like that? I think it's a plain straight spindle that has a wad of yarn wound around it. I thought you might be interested. I don't read many blogs, but yours is cool.